When I loaded it up, the above image was the Mets lineup. Obviously, since we’re going to be diving into a rebuild, the vast majority of these players will be going. 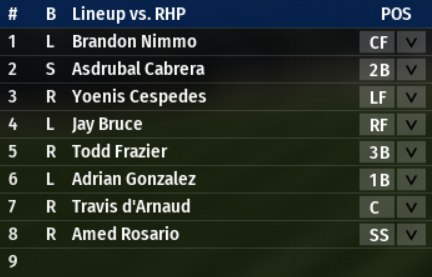 With our goal being a 2022-ish run, the only realist players from this current lineup staying are Brandon Nimmo and Amed Rosario. The notable names not shown here are Juan Lagares, who will probably be moved, and Wilmer Flores, who I’m still on the fence about. Also, Dominic Smith starts the season on the DL, and he looks like someone I will want to keep around. Michael Conforto (starts on the DL) is a really big question mark for me right now. At 25, he’s young enough to be there when we plan to be ready. He’s eligible to be a free agent in 2021, but, if I were to be able to buy out some arbitration years, and maybe lock him up until 2023, that would be a huge windfall. However, if there is an amazing offer, I might have to pull the trigger. These for guys are the best prospects we’ve got according to our new Scouting Director, Norio Yamaguchi. I wish there was a little more, but I’m going to trust in Yamaguchi’s knowledge. With what we’ve got in the future, and Rosario already playing in the big leagues, we should have a very nice infield as we start to turn things around.